I’m not sure if I’m just making this up, but I feel I’ve heard it before: “you never recover from your first love.” Do you remember that feeling, falling in love for the first time? And how, when it ended, you were sure you’d never recover, never fall in love again? You were doomed to spend eternity alone, crying, heartbroken…and then some time passed, and you weren’t alone? You moved on? I remember. It was late 1996 when I first saw him. I remember walking past him in the hall in middle school, and looking at him felt different from all of the other crushes I’d had in my 13-year-old life. There was something different and beautiful about him. His hair was dyed a reddish-pink and his blue eyes just destroyed me. I remember random things about when we first started dating, like how he came to my house and recorded my outgoing answering machine message with a snippet of “Spiderwebs,” by No Doubt playing in the background. I remember our first kiss. Our phone conversations and how neither of us would say goodbye, eventually leaving one of us to hang up on the other. I remember him taking a piece of the blue beanie he wore and tying it around my necklace. And I remember how devastated I was when he broke up with me the night before I left to Puerto Rico with my family for spring break. We lost touch after that. As high school went on, I dated others, always with him in the back of my mind. I remember feeling pangs of jealousy when I saw him in the hallways with new girlfriends or heard stories about him, missing all the fun we had together. I stuffed the feelings of love I had for him as far down as possible and just went on with my life. College began and I was in another relationship; I had moved on and life was just bumping along as it was supposed to. Facebook came out, I made an account, and when I saw he had friend requested me (one of my first there too!) I anxiously accepted. A message here and there and I was back in touch with my first love, and I was so excited to have a glimpse in to his life again. When I began my second relationship of my college years, it was oddly comforting to see he was watching. He’d send me messages asking why I was dating that new person (something I still wonder about myself…worst relationship ever), but something about getting his attention, no matter how small, meant so much. Years went by and we stayed in and out of touch until the fall of 2013. It’s an impossible dream, to think that the one who got away will come back. So when he and I began talking daily, not just through Facebook but by text and phone, I found myself scared and confused by the overwhelming way all of my childhood feelings of love came flooding back. He asked if I would meet him for a date…obviously I said yes. I remember getting in the car and crying hysterically on my way to meet him. Something inside of me told me this would be magical yet wouldn’t last very long, and I suppose looking back, I was scared to lose him for a second time. How right my intuition was. He called when I was around the block to let me know he was at the restaurant waiting for me. I nervously went over to him, and the first thing he said as he proceeded to shake my hand was, “Wow, you grew up well.” The night went smoothly, like no time had passed at all, and, before we parted ways, he apologized for breaking up with me as kids. From that night forward we began to talk daily for hours on end, driving to one another frequently. We talked about everything and anything. I was touched as he opened up to me about his battle with depression. I shared my experiences too, and we vowed to be there for one another should times ever get tough. As the months went on and we grew closer, we began talking about me coming to stay with him at the new apartment he was moving into, sharing ideas for meals we would make for dinner and other such things. One day in mid-March of 2014 he told me he was beginning to feel overwhelmed, and said he wanted to “quit his job, go on disability, and possibly have himself committed.” I promised that I would support his choice no matter what and would always be there, but, days later, he changed his tune and everything was fine. Looking back, I wish I had known this was a red flag. There he was, my first love, not only back in my life but back with me. We were building a new relationship, different and better, planning adult things together. But something wasn’t right. He started sleeping more and wouldn’t communicate for a day here and there, and it lasted for a few weeks. I remember on Monday, April 7th, 2014, he and I spoke for hours and made plans to spend time together on Wednesday when we both had time after work. I was with my friend at the time and told him I didn’t understand why he was begging to just see me that night—should I just invite him here? How will he find us? I would give anything to go back to that day and just tell him how to get to me. When the conversation stopped, I turned to my friend and said, “Why didn’t you tell me I was so in love with him? I should just tell him, shouldn’t I?” Excited that I finally realized my feelings, my friend and I sat making plans for how to share my love and I went to sleep that night feeling content. No word the next day, as usual. I assumed my beautiful love was angry that I wasn’t able to see him the night before and since I would be seeing him the next day, why bother making contact until it came time to make plans, right? I spent the whole day nervously planning my outfit, how to word things. I was scared. I sat down on my computer that night to see if he had posted on Facebook and was just ignoring me, and that’s when I saw “RIP little buddy.” Confused, I called my friend who suggested I type his name in to Google, to see if perhaps there had been an accident. When Google loaded and I saw the first article, “man identified in bridge jump,” I screamed and begged my friend to open the article and confirm what I knew was true: he had died by suicide. 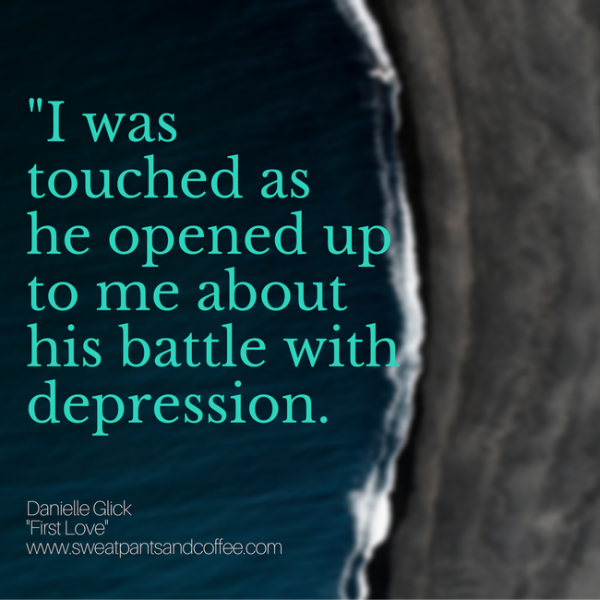 Though we spoke, sometimes at length, about our mutual experiences with depression, and his behavior had been erratic at the end, he never shared his thoughts on dying or the plan I came to learn that he had been constructing for years. As the days after his suicide went on, I went in to shut down mode. Unable to breathe, think or function in general, I fell in to the absolute worst depression I had experienced. From my years of therapy, I knew I couldn’t do this alone. I called a grief counselor and joined a support group for people that lost a loved one to suicide. I read up on Bipolar Disorder and tried to do things that eased my pain, such as writing him a letter every single day for a year. I released balloons, I made silly videos, I forced myself to socialize when all I wanted to do was be sucked in to oblivion. I orchestrated a walk team for the local Out of the Darkness suicide prevention initiative, and, with the help of his family, raised over $10,000 that was donated in his memory. But it didn’t seem enough. Before he passed away, I told him of my dreams of working with mental illness and eventually starting my own non-profit. The most supportive, he once wrote in an email that it was a brilliant idea that would benefit the world, thanking me “in advance, for helping the human race.” After his suicide, I felt too weak to be able to help others but slowly found myself reaching out through peer support, finding others who were battling depression and helping a few stop the act of taking their life as they were in process. It felt amazing, but not enough. I had to keep true to my word, and one morning, in August of 2016, I decided to go back to school to earn my master’s in psychology and was accepted this spring, three days before the three year anniversary of his suicide, in to a top program for just that. Still actively participating in suicide prevention awareness, education, and advocacy, I have hosted my own walks, and recently became the moderator for a peer support group to those bereaved by suicide loss. I’ve become a public speaker for a large mental health organization in which I not only educate about mental illness and suicide, but share my own struggles. I’ve written and published articles—writing has always been my best catharsis—and even filmed for a project about my own experiences living with major depressive disorder. I plan on continuing grad school to get my Psy.D with a focus on Bipolar Disorder research with a sub-focus on suicidality and addiction. By actively pursuing these things I am, yes, furthering my career, but I am also helping myself find the light in the perpetual darkness that has followed me since my first love passed. The best way I have found to get out of this place is to be a part of the solution. To keep fighting for my life and millions of others who, like myself, struggle not only with depression but the loss of a loved one to suicide. I believe that we can make something beautiful come from tragedy, and what better way to honor my first love’s life than to help others stay here? To stay here myself? He wanted to spend the rest of his life with me in it, and, for him, I plan to live the best life possible for the rest of mine. Danielle Glick is a 34-year-old writer and student based out of Connecticut. Currently working towards her Master’s in Psychology at Sacred Heart University, she is very active about promoting mental health awareness and suicide prevention in her community working diligently in advocacy and public education with groups such as AFSP and NAMI. Working on her first book, Danielle hopes to inspire others to share their story as to break down the stigmas that surround mental illness and addiction. She would be more than happy to hear from you – check her out on Instagram @Danielle_Glick or feel free to send her a message on Facebook. 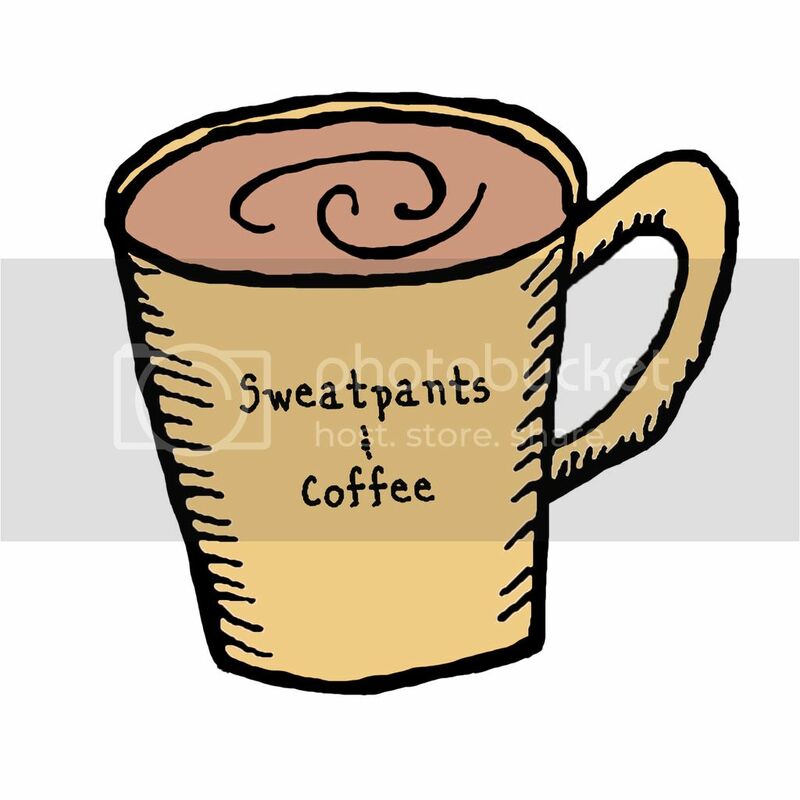 Sweatpants & Self Care | You, Me and My Mental Health- Which Comes First?